"It's Always Sunny in Philadelphia" (TV) - In a show full of characters who would become crack addicts simply to qualify for welfare, anything can happen. Perhaps that's why they call it "Seinfeld"...on crack. This show was produced for close-to-nothing by a couple of close-to-nobodies, and now it has become one of cable TV's nastiest little surprises. There's the gang: Dennis, Mac, Charlie, and Dee. And then, there's the bar: Patty's. Toss in a little Danny DeVito, the occasional abortion rally, a dumpster baby, hard liquor, maybe even a Jihad; then mash it all up with an INCREDIBLE amount of narcissism, and you've got the perfect concoction for a slap-happy night. Enjoy. "Michael Clayton" - I reviewed this flick in January, just had another viewing on Saturday, and now I think I'll go buy it. This is an exquisite movie. It's a character sketch. It unfolds slowly, striking, so very poetic. There is this scene when Michael sees three wild horses on the side of the road. He goes to them, creating this moment of sheer, literary excellence. It's phantasmal, in a way. It haunts and haunts, and it's only about a minute long, just one minute out of the whole, evocative two hours that I never thought for a second I would fall so damn in love with. Had it been any other year, George Clooney would have been handed Oscar number two. Unfortunately, Daniel Day-Lewis, when he produces, is virtually untouchable. Either way, what an achievement. "Jane Austen Book Club" - Greatest chick-flick since "Love Actually." There wasn't a moment of this film that I didn't enjoy. It's got decadence and (my favorite word) whimsy, hot guys and complex women. Basically, it's a room full of Elizabeth Bennets. There are no flailing Meg Ryan types or faux-empowered Kate Hudsons. To make a long story short, I picked up "Pride and Prejudice" for the first time in almost seven years the day after I saw "Jane Austen Book Club," and I've grown to appreciate it in ways I never knew possible. "In the Valley of Elah" - This film is a thimble of sadness and truth. It's visceral. Tommy Lee Jones has a face like soft, malleable leather. I really appreciated Roger Ebert's review of this movie, because he spent so much time on the sheer gravity of Tommy's face. It's heavy and worn. Pockets of history fall from his eyes. His eyes--pebbles that have seen the maladies of the world; his hands--strong talons that have embraced them. I like this movie best of all the Paul Haggis gems. Even Million Dollar Baby. I feel that this film manages to be important without preaching anything. It's the only Iraq film that really did well in 2007--not in the Box Office, but in the critics' viewings--and for good reason. It approaches not with political agenda, but with a sickening sense of reality. I didn't feel anything after this movie, but that night, I awoke several times, dreaming of the sadness. But the film is well worth it. It's simple and straight forward. The direction and performances are seemingly unparalleled. Any other year it would have swept the Academy with ease. "American Gangster" - Wow. I can't say I've ever been more surprised. I don't know what my deal was, but for whatever reason, I just underestimated this movie to the point that I would make up excuses for why I refused to see it. "I hear it's unrealistic." "I hear it's like black 'Godfather.'" But I was so, so wrong. Ridley Scott is in rare form for American Gangster. The film itself seems straight from the 1970s. It's saturated and raw. The lack of recognition for this film, I think, is preposterous. It's long, but it's perpetually gripping. The plot pushes forward with such a fulfilling tenacity. Russell Crowe is luckless, lovable, course as steel wool. Denzel Washington is like a sneer. A dark shadow. He's a business man, a family man. He's almost some modern version of Daniel Plainview. 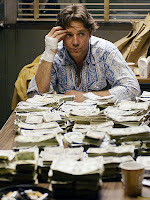 I'll go so far as to say that American Gangster is the most entertaining film I've seen in a while. Much like In the Valley of Elah, this film would have held the Academy captive in any other year. 2007 was just so freaking amazing.